The 2011 Cinemanila International Film Festival, in cooperation with the City of Taguig, will honor Dario Argento, Italian film director, producer and screenwriter, with the Lifetime Achievement Award on 11 11 11, during the festival’s Opening Night. Argento, 71, is best known for his work in the horror genre, particularly in the subgenre known as giallo (Italian for ‘yellow’, or more precisely, ‘thriller’), and for his influence on modern horror and slasher movies. Argento is also known as the Italian Hitchcock. His more popular works include the international hit The Bird with the Crystal Plumage (1970), the surreal horror film Suspiria (1977), and the violent mystery-thriller Deep Red (1975), considered by many critics as the best giallo ever made, and which inspired many film directors, such as John Carpenter, to work in the genre. Suspiria will be screened during the festival among Argento’s other films. Other notable credits include the spaghetti western classic, Sergio Leone's Once Upon a Time in the West (1968) (story), and the cult zombie film, George Romero's Dawn of Dead (1978) (producer). More recent works include Trauma (1993), The Stendhal Syndrome (1996), and The Phantom of the Opera (1998) (all of which featured his daughter Asia, an accomplished actor and filmmaker in her own right). 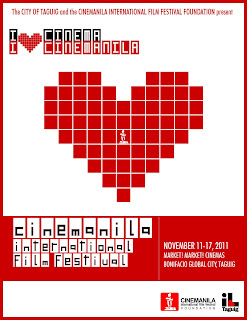 Previous recipients of the Cinemanila Lifetime Achievement Award include, to name a few, US filmmakers Quentin Tarantino (2007) and Paul Schrader (2009), Indonesian actress and filmmaker Christine Hakim (2003), film programmers Aruna Vasudev and Philip Cheah (2006), and Pusan International Film Festival founding director Kim Dong Ho (2005). Aside from these personalities, other special guests who graced Cinemanila in the past include Jafar Panahi (The Circle, 2000) and Fernando Meirelles (City of God, 2002). For those, like me, who aren't familiar with Mr. Argento's works, follow this link to his Wikipedia page and this link to IMDB.